The Wasilewski grocery on the corner of Hamilton street and Carl street was destroyed in 1956 when a US Air Force training jet crashed into it. Nobody died. The crew had ejected after running out of fuel and the store was empty at the time. Several people in the neighbourhood were injured by flying glass and pieces of wreckage. The lot was cleared of rubble, but nothing was ever built there again. Ten years earlier, at a quarter past ten on the night of 12th December 1946, two men wearing red, hooded masks walked through the doors of the store, pointing pistols at Rose Wasilewski, who was dusting a shelf, and her nine-year-old daughter, Donna, who was at the check-out counter. One stayed by the entrance while the other reached into the till and took $149 in notes, leaving the silver. John Wasilewski and his son, Eugene, who had been butchering meat in the back room, came into the front shop and shouted, “Get out of here!” The hooded men ran into the street and drove off in a car that they had stolen earlier from outside a nearby house. They abandoned it a few streets away and ran off in opposite directions. Two weeks later, the Lawrence laundry on South Mill street was broken into by burglars who smashed open the safe and stole the 95 cents that it contained. It was the least successful robbery in a series of safe-cracking jobs that had had taken more than $7,000 that year. In March 1947, three months later, state police arrested a gang of seven men for the crimes. 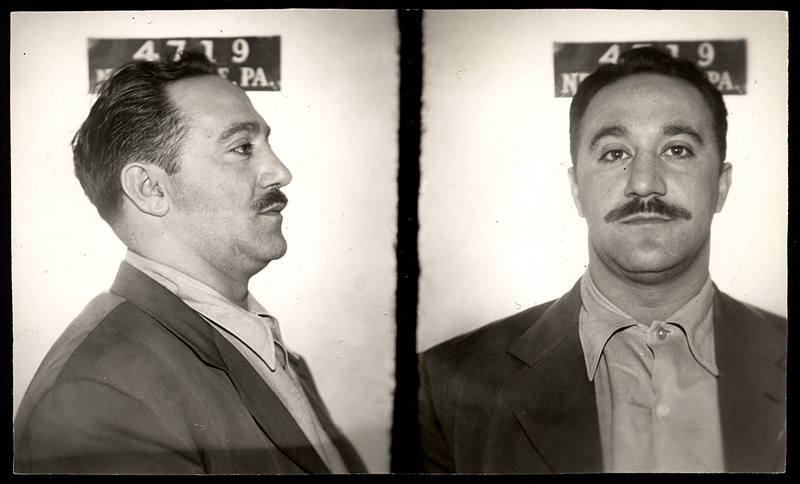 One of them, twenty-one-year-old Sammy Sams, confessed to breaking into the Lawrence laundry (along with Frank Largo, the brother of Ralph Largo) and later signed a separate confession in which he admitted to the Wasilewski hold-up but said that it had been the idea of his friend, Leonard D’Antonio, a foreman at Mellon-Stewart Construction, who had come to his house that night with two red hoods and told him that he knew a way they could make some money. Leonard lived with his wife and children on Pollock avenue, in the home of his father-in-law, Frank Macchia, a New Castle police officer. He was arrested and taken to the state police barracks in Butler, where the confession was read to him. He said, “Sammy Sams must have quite an imagination,” and refused to say any more. At the trial, Sams admitted his part in the string of robberies for which he had been arrested, but said that he had not written the confession implicating Leonard in the Wasilewski job and had signed it only after taking a beating from the state police. Nevertheless, the jury found both men guilty. Leonard’s lawyers immediately asked for a retrial, which was eventually granted. (A similar request from Sams was denied, and he was sentenced to three to seven years in the Western penitentiary.) After Leonard had spent seven months in jail, but before the date on which his new trial was to begin, the case against him was dropped. Judge Braham criticised the state police’s investigation and the prosecution’s conduct and remarked on the general thinness of the evidence behind the conviction. Leonard was released the week before Christmas. The following year, Leonard and his family moved to Los Angeles, where he worked as a self-employed truck driver for twenty-eight years until 1975, when e died from a heart attack shortly after getting out of bed one Saturday morning. He was fifty-eight years old. Sources: New Castle News (1 Oct 1944, “D’Antonio-Macchia Nuptial Ceremony”; 13 Dec 1946, “Two Bandits Get $300 In Holdup”; 31 Dec 1946, “Lawrence Laundry Reported Robbed”; 24 March 1947, “Six Arraigned For Burglaries; Waive Hearings”; 25 March 1947, “Two More Charges Made In Robberies”; 26 March 1947, “Pleads Not Guilty To Robbery Charge”; 27 March 1947, “D’Antonio Held For Grand Jury”; 10 June 1947, “Start Defense In Robbery Case”; 11 June 1947, “Jury Gets Robbery Case About Noon”; 24 June 1947, “Sentence Seven In Safe-Cracking Robberies Here”; 5 Dec 1947, “Grant New Trial To Convicted Man”; 20 Dec 1947, “Dismiss Charges In D’Antonio Case”; 16 March 1948, “Court Adds Time To Sams Sentence”; 26 Sep 1967, “Macchias To Celebrate Their Golden Wedding”; 27 May 1975, “Deaths Of The Day”). Whoa… somebody didn´t like their son-in-law maybe? Or a state/local police feud that got out of hand? I bet that Christmas Dinner was pretty damn surreal for all concerned. Most of them are, in my experience. I looked up the Father in Law and looks like he passed away about the same time as Leonard. There is an interesting story lurking in this thread. Yes, there’s definitely more to it than I’ve been able to find out. You have to be careful when you start looking under rocks, though. You never know what you’ll disturb. Yeah, that ‘training jet crash’ sounds awfully convenient. Stay away Diarmid, we don’t want anything to happen to you.